A busy week of travelling and fishing has left me woefully behind with keeping the blog up to date. So I am going to try and catch up as best I can this week. I was up North visiting family and managed to track down Del Spry (no easy feat) for a day on the river. I had fished here before with Del and Graham Lumsdon and was mightily impressed with the River and the fish in it. Del and I met up in the car park at Appleby and we tucked into a bacon bap and a cup of coffee Del had picked up from Greggs. He had also sorted the tickets out; it was a good day so far! 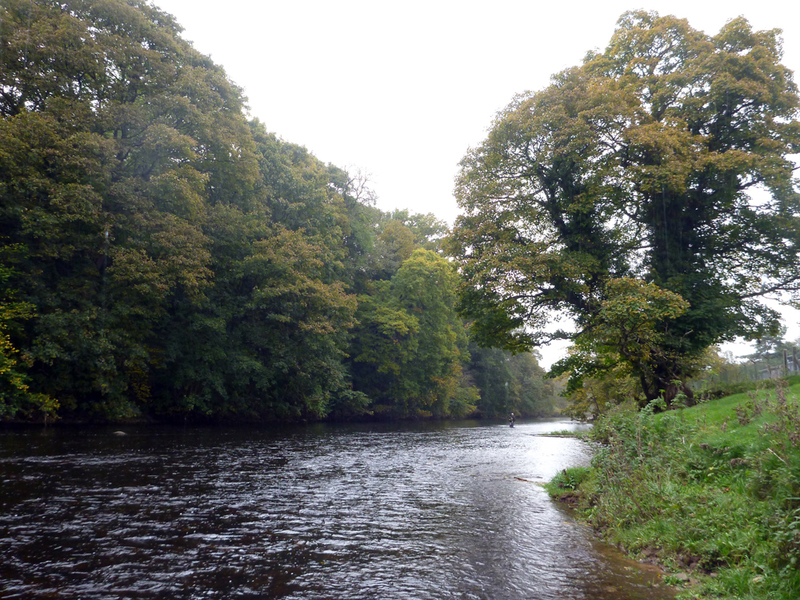 The weather has been so mild even in Cumbria and there has not been much rain, the river was in perfect nick. It was much lower than the last time I had fished there and on a mild Autumn day we were both hopeful of a few Grayling. We started to fish not far from the bridge and fished some runs that had produced for Del in the past. We did not really get of to a flyer though Del managed one small fish and I had a half-hearted offer. We decided to walk downstream a bit until we found some water with a bit of flow to it. Not far down there were a couple of favourable looking runs and we decided to give them a go. Both the runs were good and gave up plenty of fish but nothing of any real size. Perfectly formed but in the 25-30cm bracket so it was time to push further down. Those that know the river well will recognise a small Island that has several tasty looking runs coming of the back end of it. I told Del to have a couple of casts in these pools so I could take some photos. He was only rigged with light nymphs though so I offered up my rod with some heavier ammunition on the end. I took a few photos but no rod bending was forthcoming. He had handed me his rod a 10’ Hanak comp rod it felt feather light after I had been wielding my 11’ Streamflex about. I thought to give it a couple of casts while Dell was working his way up a run. The flies I was fishing were far to light for the pace of water in front of my but I just wanted to see how it cast. First couple of goes saw nothing untoward. I was impressed by the rod and was just thinking how much when the whole thing locked up. I was not sure at first but thought it might have been a OOS Brown trout. 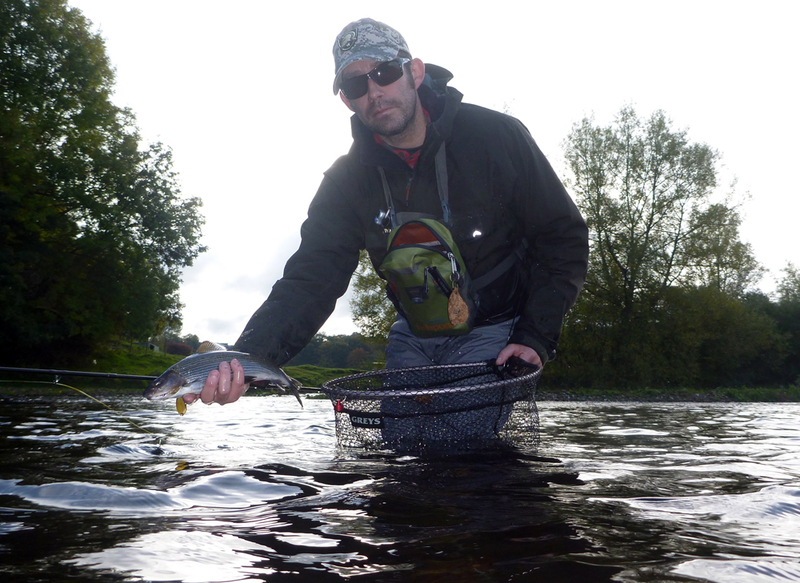 No such thing a big Grayling shot out of the river and into the air making a huge splash. All at the same time I shouted Del and ran down stream trying to get below the fish in the fast current. I knew this was a great fish and was keen to get it to the net. Not having my own kit was a real disadvantage not knowing how much stick Del’s kit would take. I played the fish carefully and did get down stream of it at one point. The fish fought like a demon though and got below me once more. As Del was arriving at my side I felt sure the fish was beat, as I stretched out the net ready to try and fit the fish into it disaster! The huge Grayling raised its dorsal fin like sail boat and the hook parted company with the tippet. A little distraught we went back to fishing the runs for a few more fish. After a while catching lesser fish we decided on a walk down to the bottom of the beat. It was great looking at the river a discussing where would be best to get in and fish. Del and I strode down catching up with each other’s lives in some very warm sunshine. We got down to the bottom of the beat and Del slid down the bank to fish a promising looking run. I moved up about hundred meters to fish below the island that had some very promising looking runs. The promise held good and several reasonable Grayling came out as did several less welcome visitors in the guise of Brown Trout minus one as JT would say! In a short while My phone went the normal run of things I would not even look at my phone whilst fishing. Experience however has taught me that when my mum has my kids its best to check. I digress a little but I remember once the phone going and my mum was ready to cut my youngest daughters hair off. Sasha had been playing with one of those stupid electric hand fans and gotten too near Lucy’s head, you can imagine the result. Anyways long conversation short Lucy still has a full head of hair. However, this phone call was from Del, he had just pulled out three 40cm Grayling on the bounce and wondered if I fancied going down to have a go as half the run was still to be fished. I declined the kind offer and continued to fish the water in front of me and there was plenty of it. Del and I met later on and started to stroll back up the stream dipping in here and there. Sometimes it was for a bit of silver other runs proved less favourable. I don’t know where the day went but before long the last of the daylight was fading into dusk. To be honest both Del and I were hanging out at this point eight hours fishing no drink or food, we had forgotten to eat lunch. We made the car before the light had finally gone and said our farewells. I nipped over to the Appleby chippy who much to my surprise did haggis suppers result! Great day and I look forward to my next trip North.